High street favourite Clarks has teamed up with American Woolrich Woolen Mills to produce a limited edition chukka and desert boot. The two new styles feature the signature Woolrich plaid wool print and come complete with black suede panels, in a superb rework of the traditional Clarks Originals silhouettes. The collection is being released in time for autumn/winter 2013 and combines the best of the brands – fusing authentic British heritage with a touch of vintage Americana. He is not wrong. First up we have the Wallabee: the boot was first launched by Clarks back in 1964 and features a moccasin-style lace-up body with a crepe sole. The Woolrich version features their wraparound plaid wool upper with a black suede front. However, highlight of the collection has to be the timeless desert boot. An iconic silhouette that will forever be engrained in Clarks’ heritage, it is a versatile style that can be dressed up or down, in summer or winter, due to its simple, clean lines and unfussy lace up front. 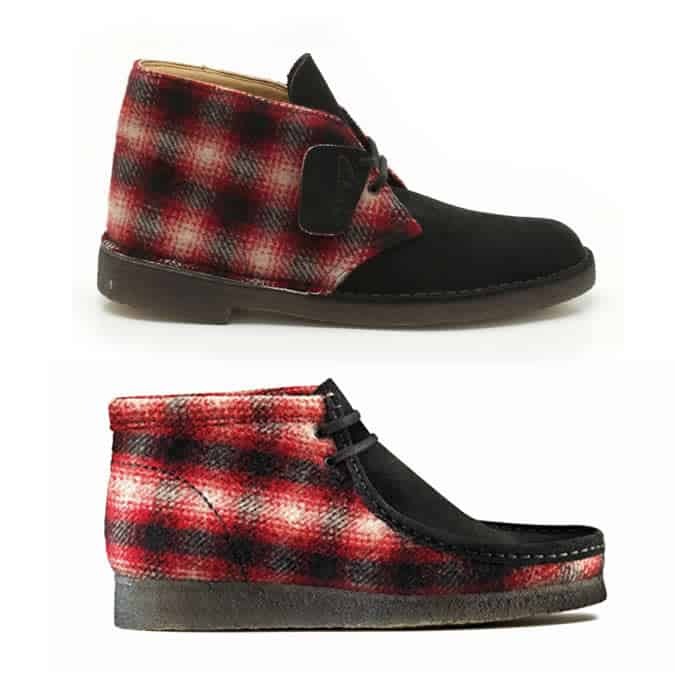 For this collaboration the traditional suede desert boot has been reworked in red, black and cream plaid, and is finished with a contrasting black suede toe. A seasonally-appropriate take on a classic piece of footwear, the plaid and suede contrast gives the style a beautiful tactile element and would look perfect paired with dark indigo jeans and other workerwear-inspired pieces this AW13. The boots are priced at £89 each and are available in Clarks stores and online at clarks.co.uk.